BACK BY DEMAND AND FOR A LIMITED TIME!!! 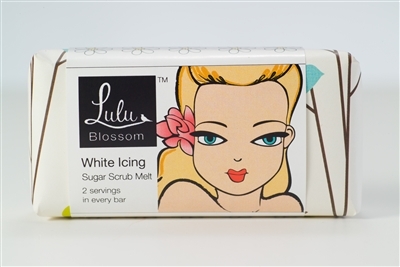 White Icing scrub melt bars are great for exfoliating dry patches, getting a nice clean shave and moisturizing skin. The bar can be cut into small pieces to target smaller spots or cracked in half for bigger jobs. The Shea and Cocoa butters melt into the skin while the sugar exfoliates. It's gentle enough to use all over including the face. It's sweet vanilla scent is scrumptious.